Located on Pathology 7, the Surgical Neuropathology Consultation Service provides review of outside surgical cases of lesions in and around the brain and spinal cord. Most of these consultations are instigated by pathologists uncertain as to the nature of a lesion; some are requested by a treating physician; and others, increasingly, are done at the request of the patient. While a tumor is the typical condition being studied, inflammatory and infectious lesions are also evaluated. Questions such as “Is any abnormality present?”, ”Is a tumor present?”, “What kind of tumor is this?”, “Is this patient eligible for a cancer treatment protocol?”, and “What is the nature and cause of this inflammatory lesion?” are common. Specimens are received and accessioned directly by the Service or through the departmental Surgical Pathology Consultation Service in Reed Hall. The Surgical Neuropathology Service has a close reciprocal relationship with the Johns Hopkins Division of Surgical Pathology — seeking its advice about certain lesions and giving ours in others. The staff interacts closely with Hopkins neurosurgeons by servicing all in house intra-operative consultations (“frozen sections”). The close pathologist-surgeon interactions critical for such studies are facilitated by the proximity of the neurosurgical operating suite on Blalock 7. We are also available at any time to review in-house cases with clinicians, whether neurosurgeon, neurologist, endocrinologist, or specialist in infectious disease. 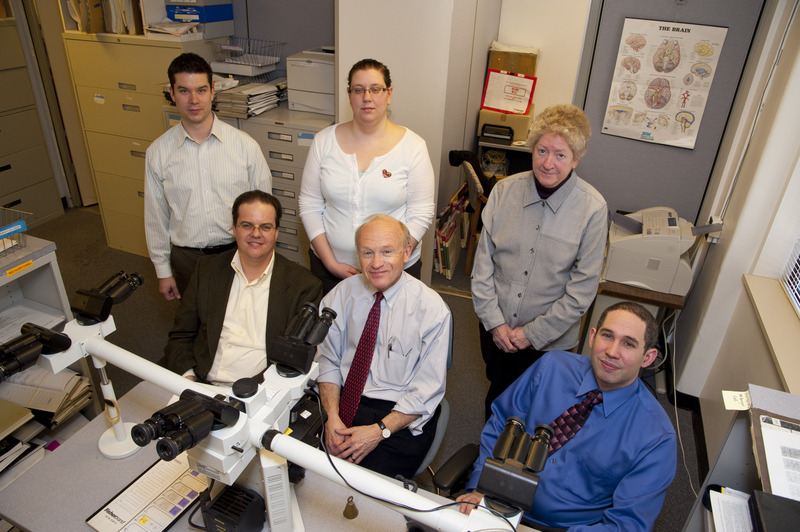 Educational functions include training of Hopkins pathology residents, our neuropathology fellows, clinicians, outside pathologists, or medical students during electives in pathology. Medical students get the opportunity to witness the critical, interactive role of pathology in the diagnosis and treatment of disease. Professional staff members include the service director, Dr. Peter C. Burger, and our new faculty member, Dr. Fausto Rodriguez. Dr. Rodriguez, trained at Mayo Clinic, was a faculty member there until he assumed his Hopkins position last November. Specimens from the eye and orbit are reviewed by Dr. Charles G. Eberhart, director of two Departmental divisions, Neuropathology and Ocular Pathology. The Service depends on a smooth flow of case material, meticulous record keeping, careful tracking of cases, and responsiveness to referring pathologists, clinicians, and patients. Good customer relations are critical. These administrative functions are ably accomplished by our dedicated and experienced administrative coordinator, Leslie Reynolds, who has worked on the Service for five years, and in the Department for 13 years. She and her mother, Linda Parsons, have combined 58 years of service to Johns Hopkins Pathology! Patricia Goldthwaite, the second staff member, has herself been at Hopkins for 36 years. Experienced in all aspects of pathology as it relates to patient care, Patricia works closely with the intra-operative consultation process, resolves cancer treatment protocol issues, and interacts extensively with senior staff and residents in Neurosurgery and Neurology. We depend upon, and work closely with, the laboratories of Histology and Immunohistochemistry, as well as the Division of Molecular Pathology in our daily work, as well in the implementation of new diagnostic tests. I work at National Cancer Institute, Rio de Janeiro, Brazil, a government institution. I would like to known if I can send somes cases to Dr Fausto. I`am a Dr Nascimento`s friend. Dr Nascimento works with Dr Fausto at Mayo Clinic. Five Pathology Employees Share Their "Path" to Better Health Through Exercise!